2 hour therapy session in Manchester including: Consultation, Chakra Assessment, Guided Meditation, Reiki Chakra Balancing Treatment, Spiritual Crystal Healing Treatment, Spiritual Coaching & Guidance. One evening with DJCaptainBob "The DJ who cares about the people as well as the music"
Grassroots Suicide Prevention charity is holding a fundraising Celebrity Auction of Promises at All Saints Church, Hove. Grassroots is a Brighton-based education and campaigning charity proudly working towards making Brighton & Hove the UK’s first Suicide-Safer City. The money raised will go towards our ongoing efforts in supporting community members to prevent suicide. 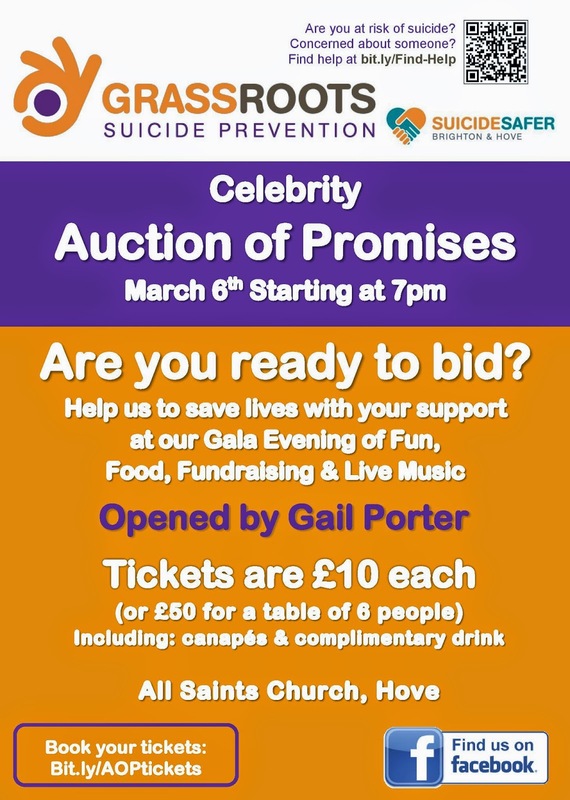 Doors open at 7pm and there will be live music during the evening, with the auction starting at approximately 8pm. There will also be a bar throughout the evening and music after the auction ends. Please do join us and come along - even if you’re not sure about bidding this will be a great night out supporting Grassroots! However we would still love more pledges! office@prevent-suicide.org.uk or phone us on 01273 675764.